Congratulations to Larry Morris for winning the inaugural 'white sail' award at last weekend's MRSA spring classic. The competition was fierce between Larry and John Maliszewski, but ultimately Larry, with crack crew Mike Nikolich, prevailed and took the division. It was clear on the water that Larry has adopted my motto of 'Win by leaving the dock' as he was clearly still mid-stream in a window repair job and sporting some nice blue tape and protective plastic over his port lights. 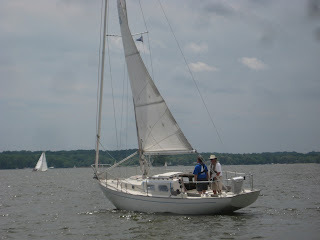 Thanks to both Larry and John M for participating in the White Sail division. I hope you folks make it for the Miles River Race as well! It's great to see the white sail boats out there! The more the merrier.